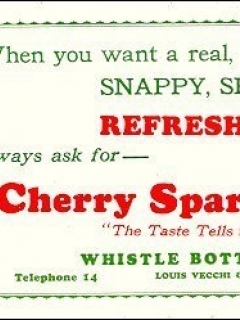 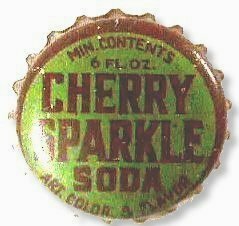 Companies: Whistle Bottling Co., IMPKO, Western Stationery Company Yachats Oregon, C.B. 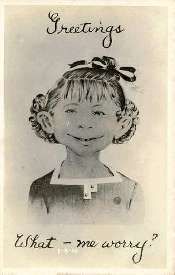 Moseley Co., Pucks Library, Ohio University, Strobridge Litho Co., Mt. 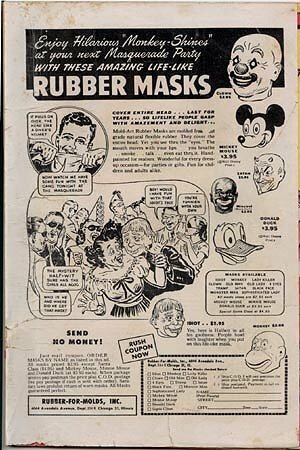 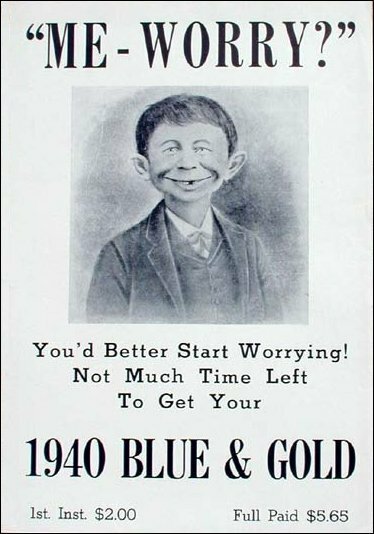 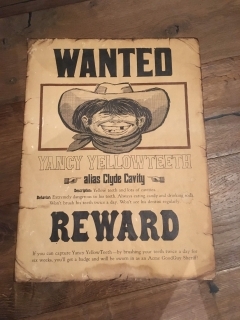 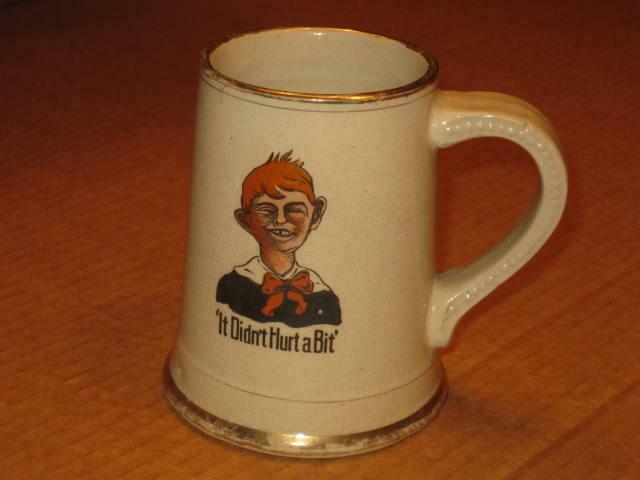 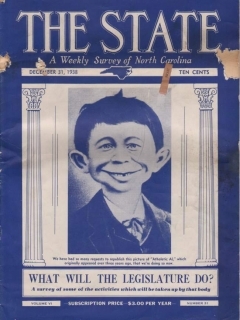 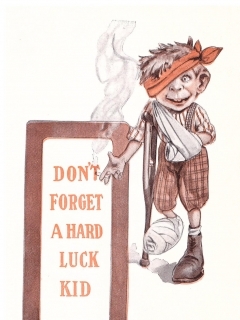 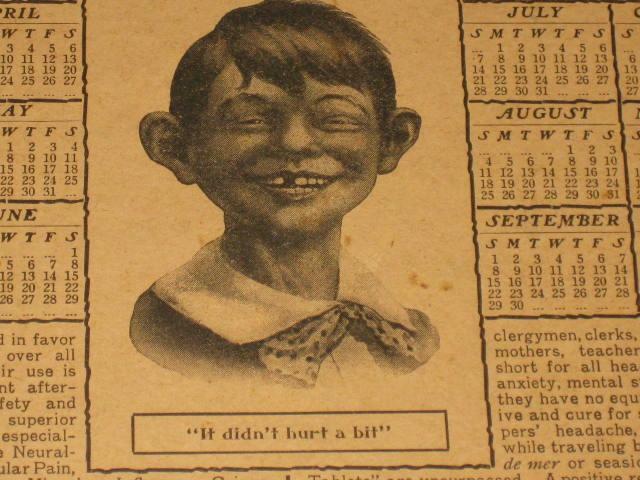 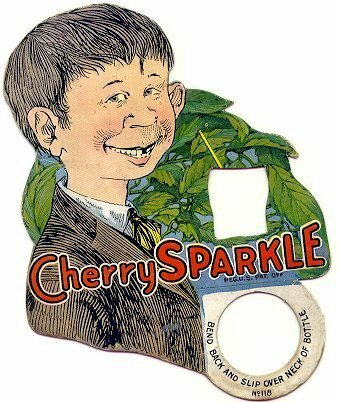 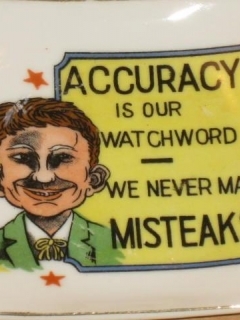 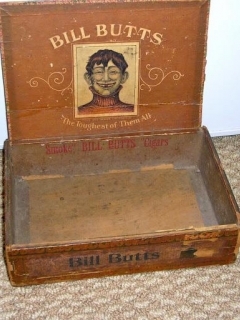 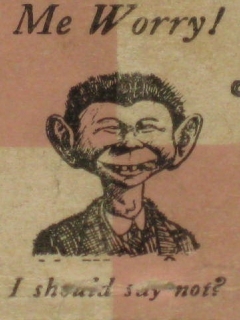 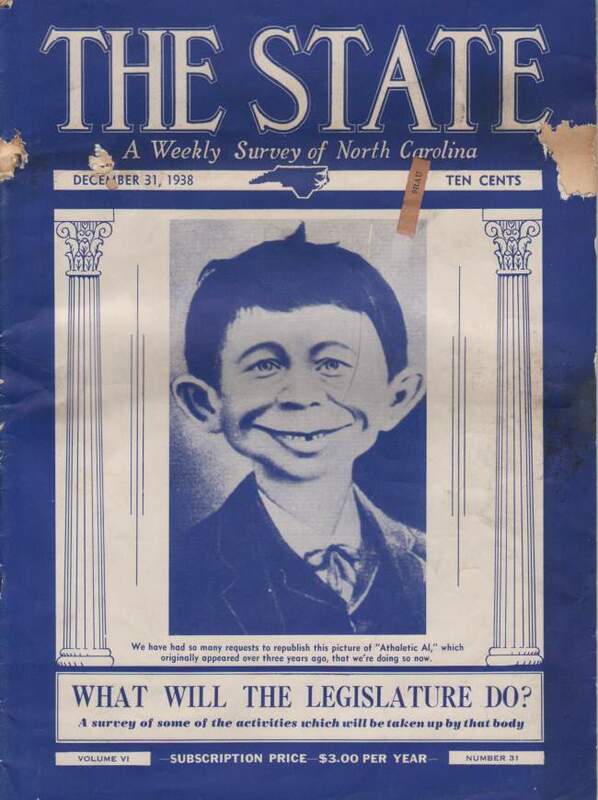 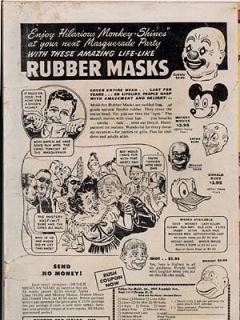 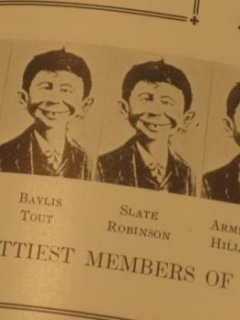 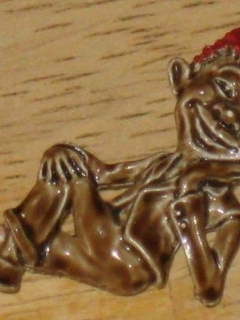 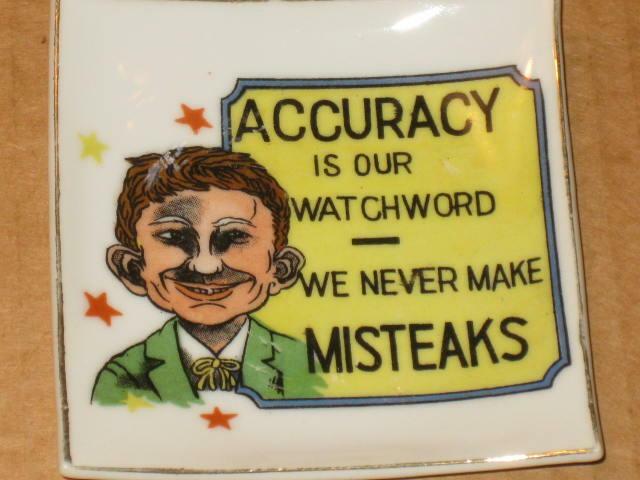 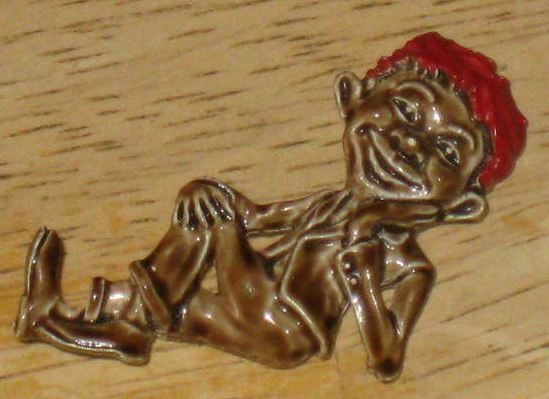 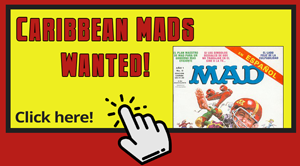 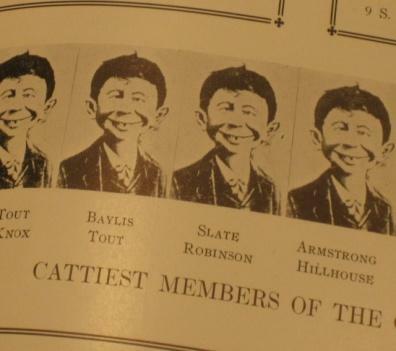 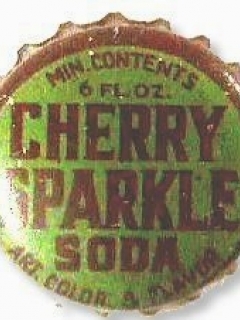 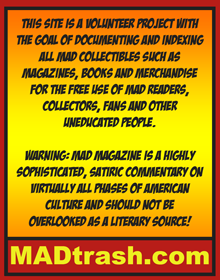 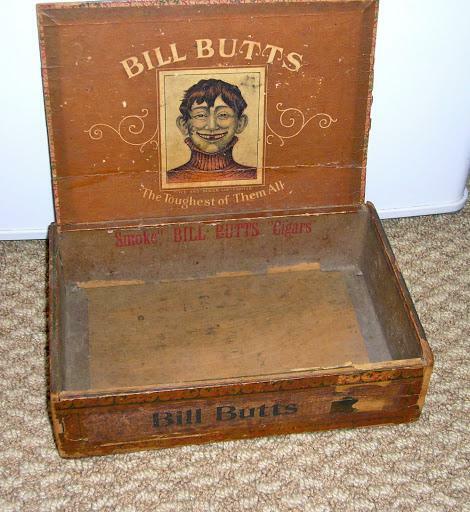 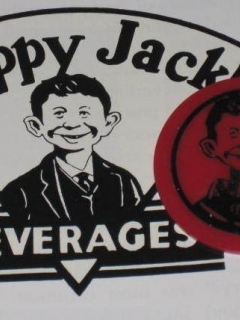 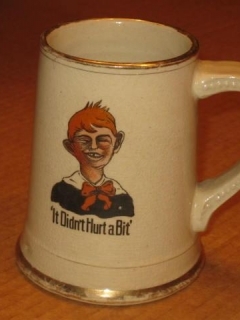 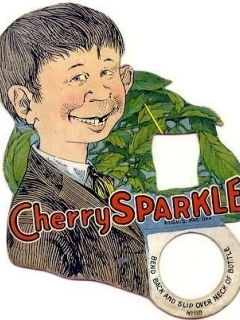 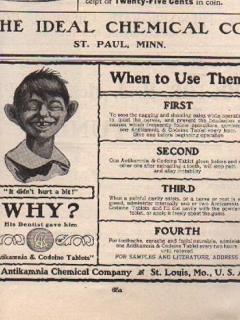 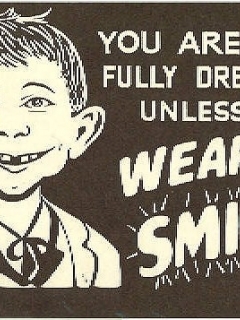 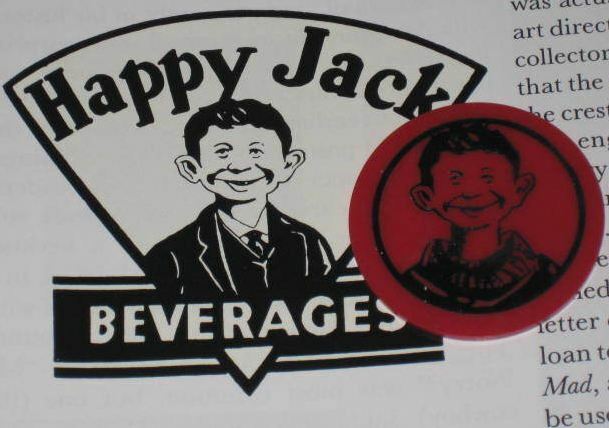 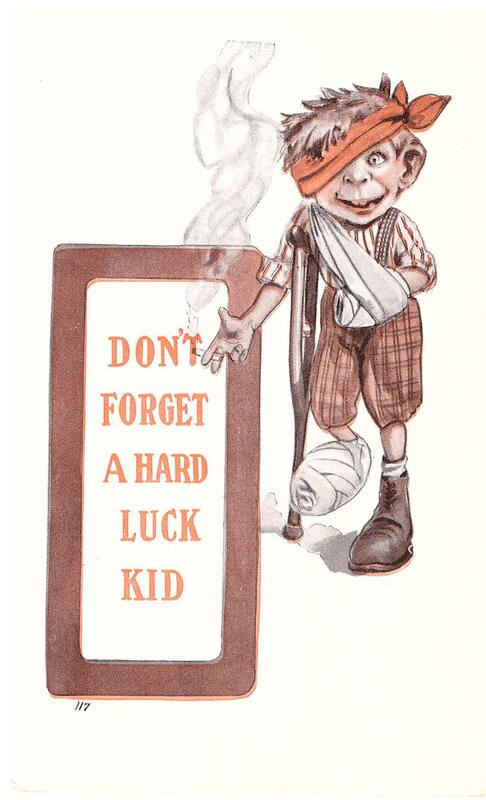 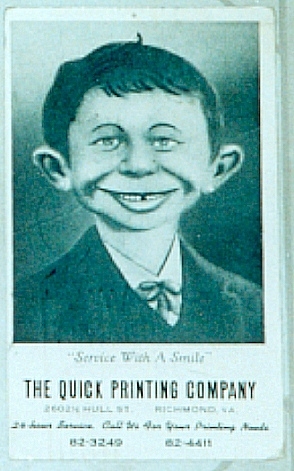 Royal Cafe, Joe's Bar, BILLY RILEY and BILL BUTTS, Edward Gross Co., N.Y., Diamond Match Company, New York Dental Parlors, Antikamnia Chemical Co.
1910's MAD MAGAZINE Alfred E. Neuman "Don't forget a hard luck kid"
Ashtray Pre-MAD Alfred E. Neuman "We Never Make Misteaks"
Drinking Glass Pre-MAD Alfred E. Neuman Ohio University O.U. 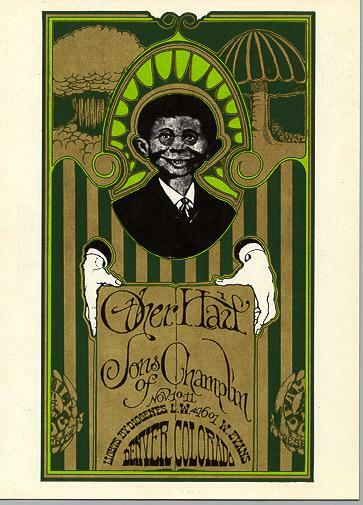 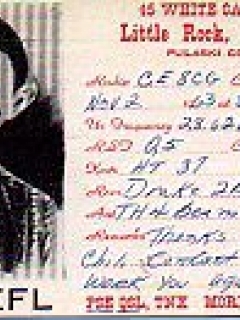 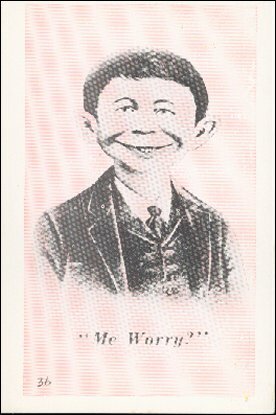 Postcard Alfred E. Neuman "Pearl Beer"
Postcard Alfred E. Neuman 'What, Me Worry?' 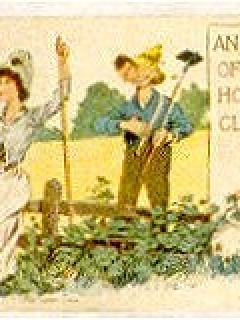 Great Oak Inn. 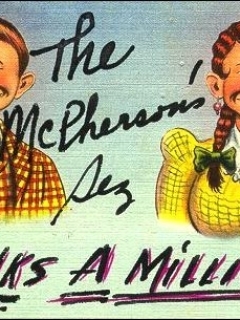 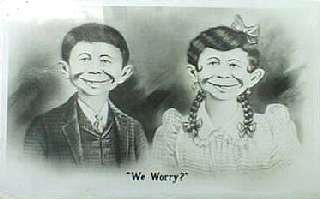 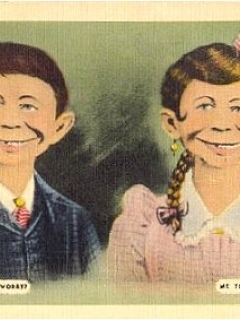 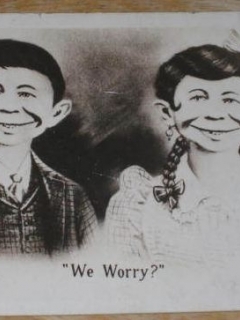 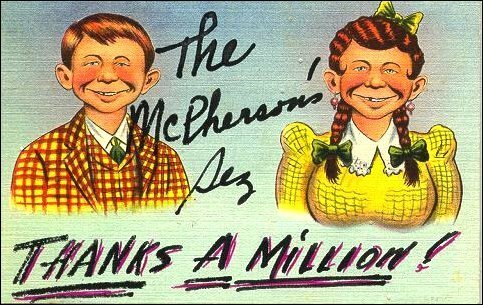 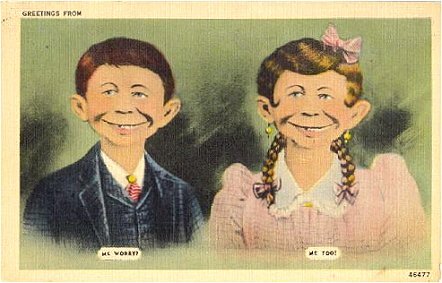 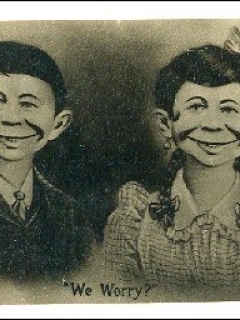 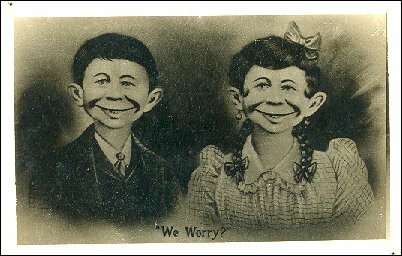 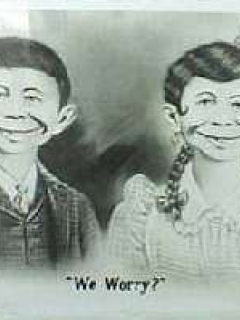 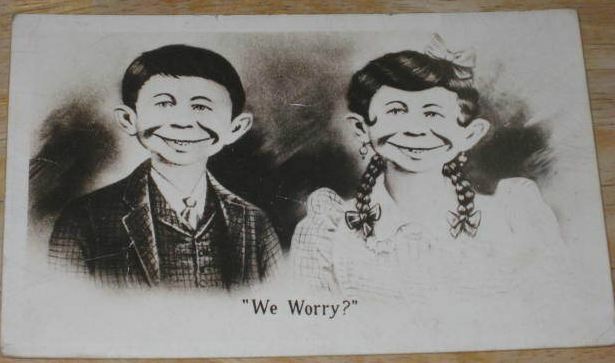 N.J.
Postcard Alfred E. Neuman w/ Sister MOXIE We Worry! 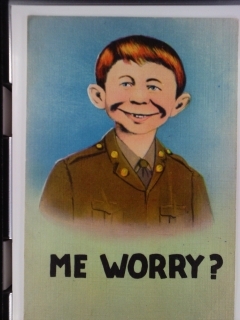 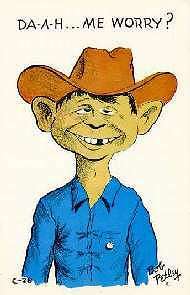 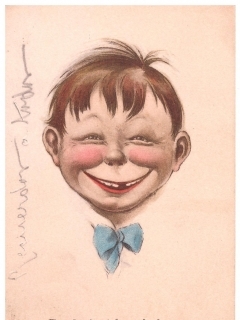 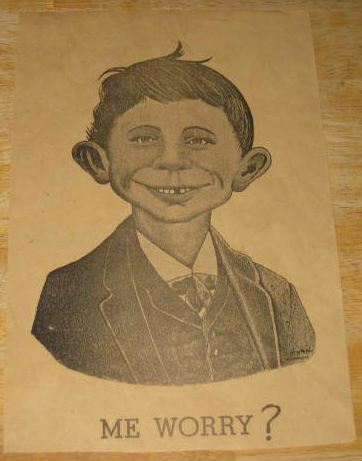 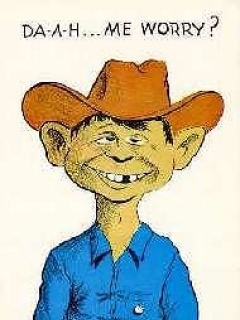 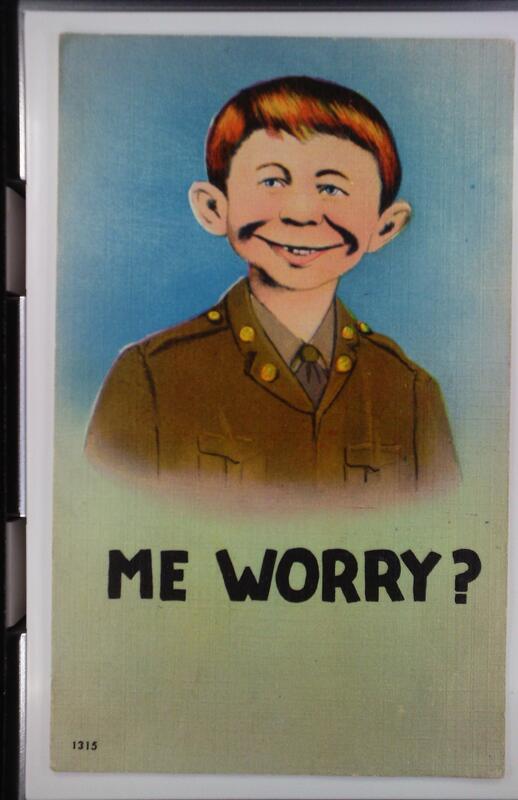 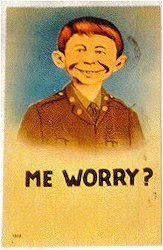 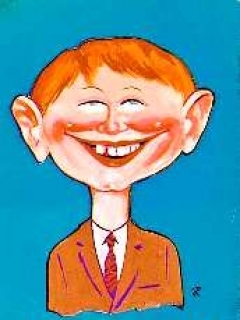 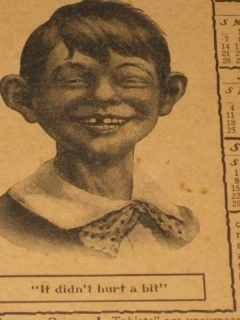 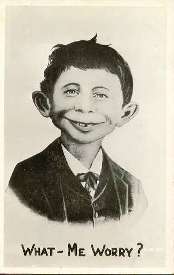 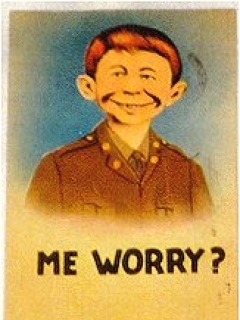 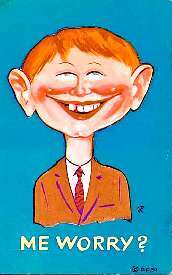 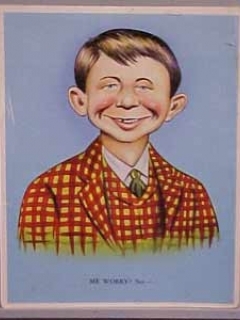 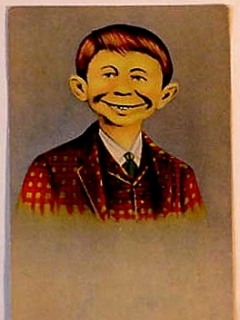 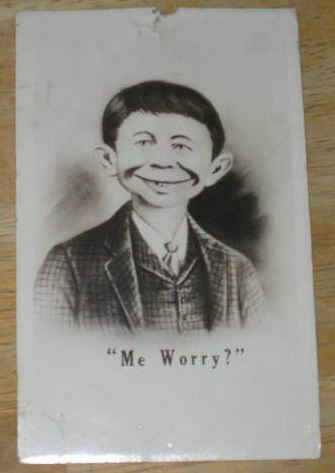 Postcard Large Pre-MAD Alfred E. Neuman 'What, me worry? 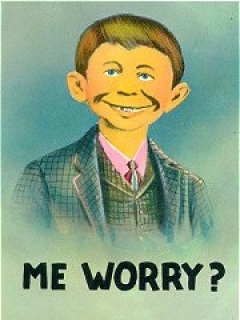 Postcard Pre-MAD "What me Worry?" 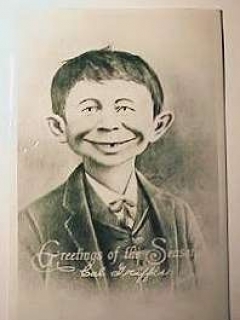 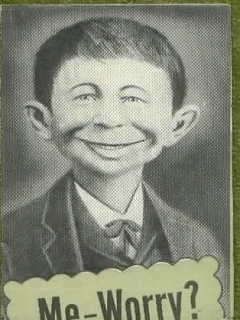 Alfred E. Neuman "Alfred Hey Seed"
Postcard Pre-MAD Alfred E. Neuman "Broadway Hotel Cincinnati"
Postcard Pre-MAD Alfred E. Neuman "Hello from New York"
Postcard Pre-MAD Alfred E. Neuman "How-Beau"
Postcard Pre-MAD Alfred E. Neuman "I work for the Guv-Mint"
Postcard Pre-MAD Alfred E. Neuman "Me worry?" 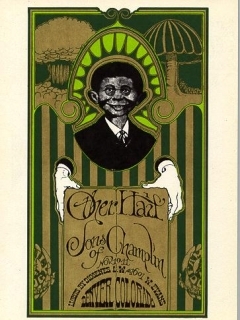 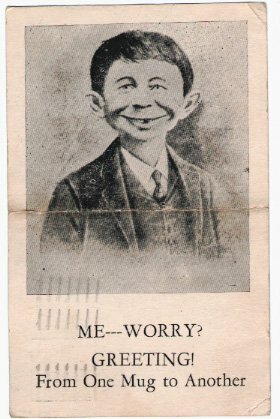 Postcard Pre-MAD Alfred E. Neuman "Oscar's Lunch"
Postcard Pre-MAD Alfred E. Neuman "So What"
Postcard Pre-MAD Alfred E. Neuman b/w "Greetings...What me worry?" 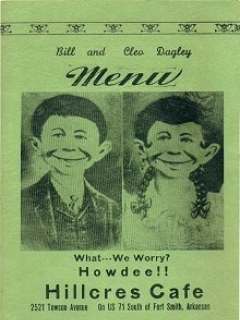 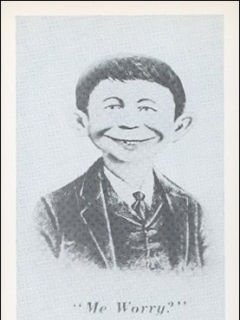 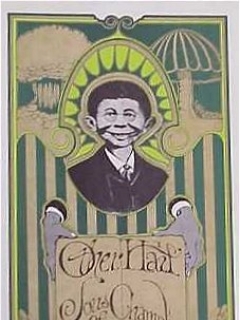 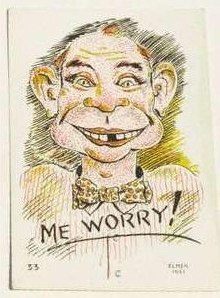 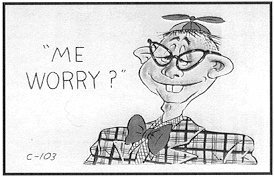 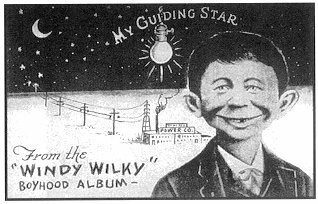 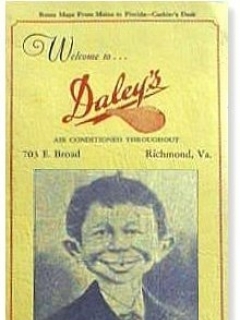 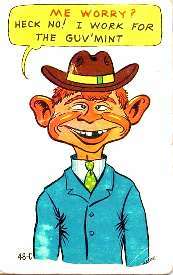 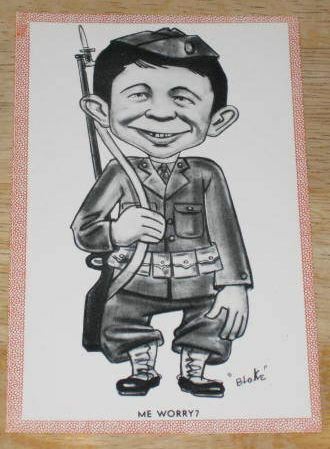 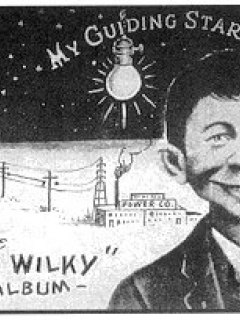 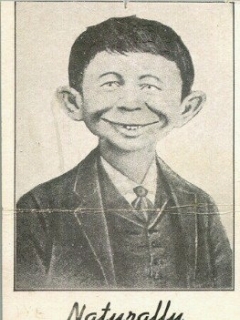 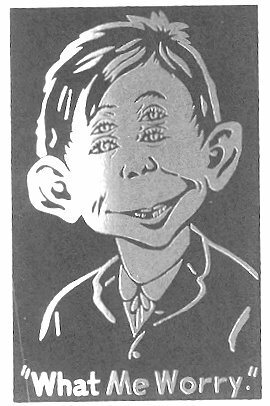 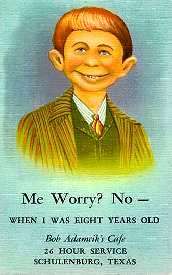 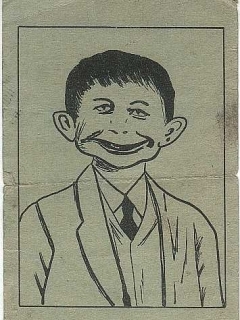 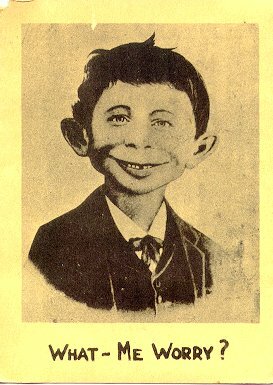 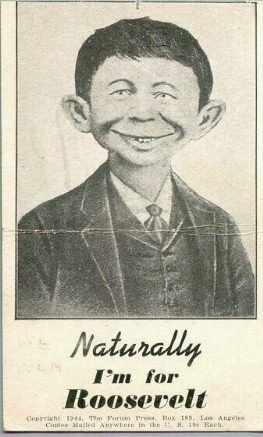 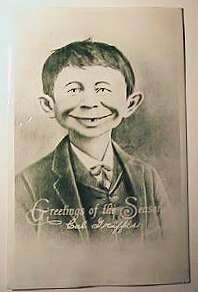 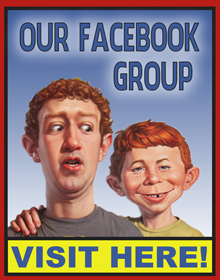 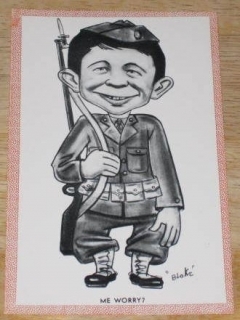 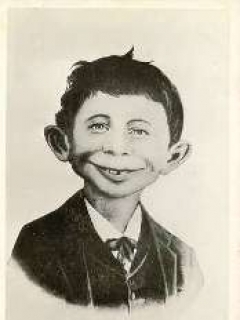 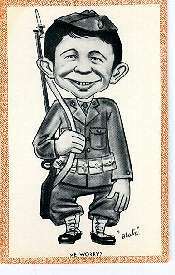 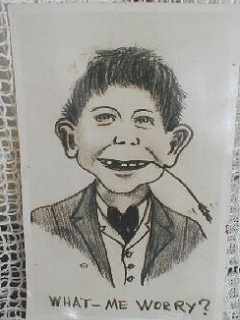 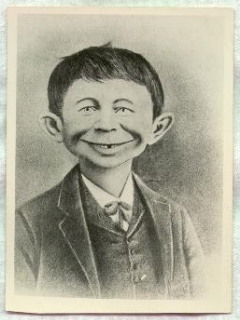 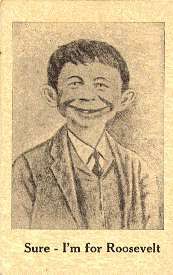 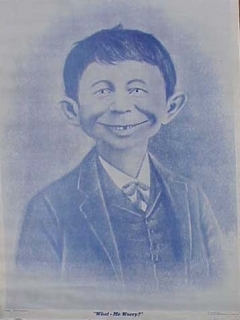 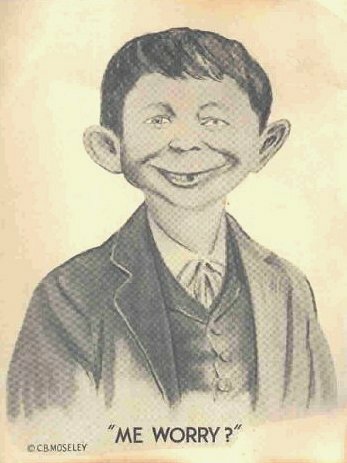 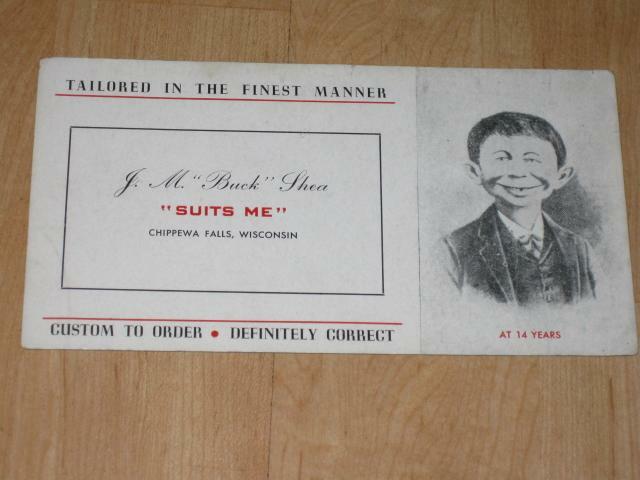 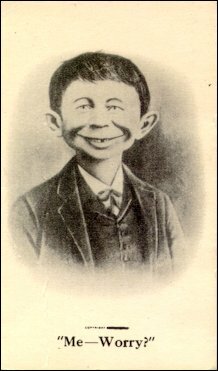 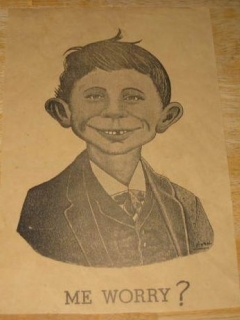 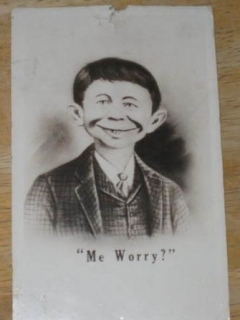 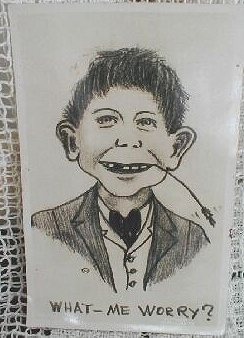 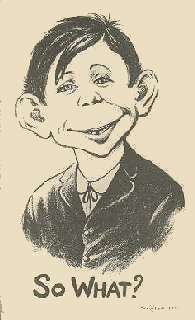 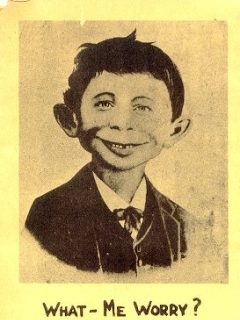 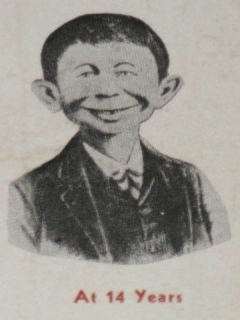 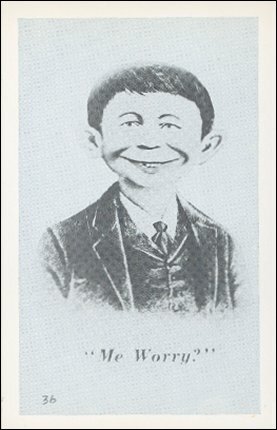 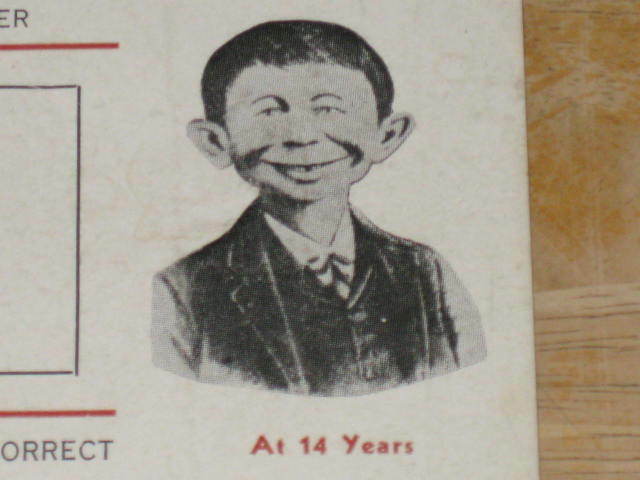 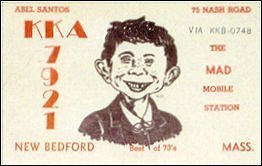 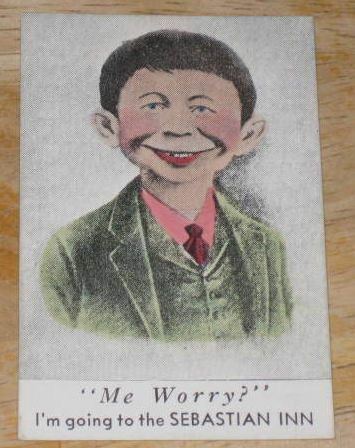 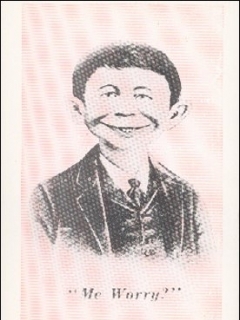 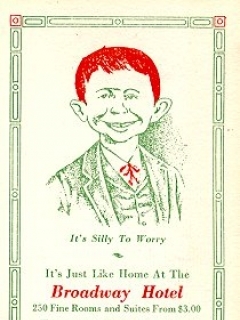 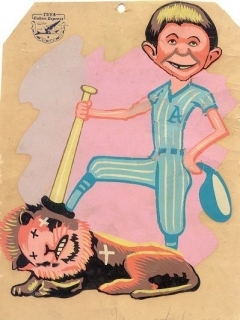 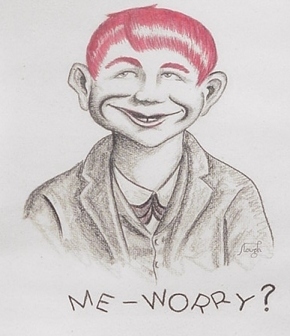 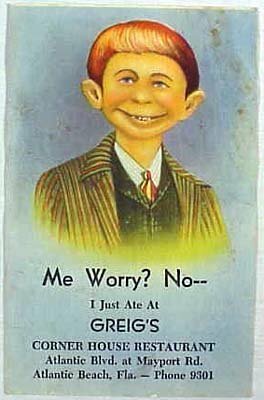 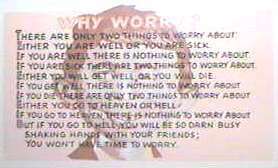 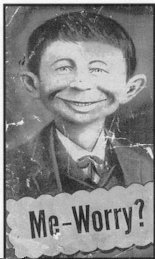 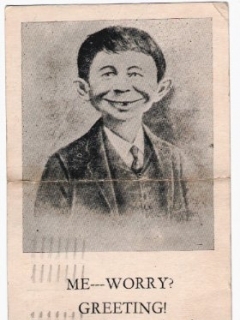 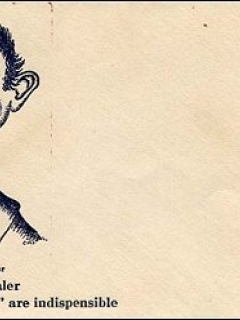 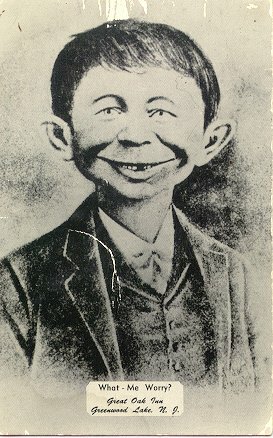 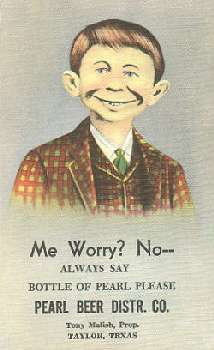 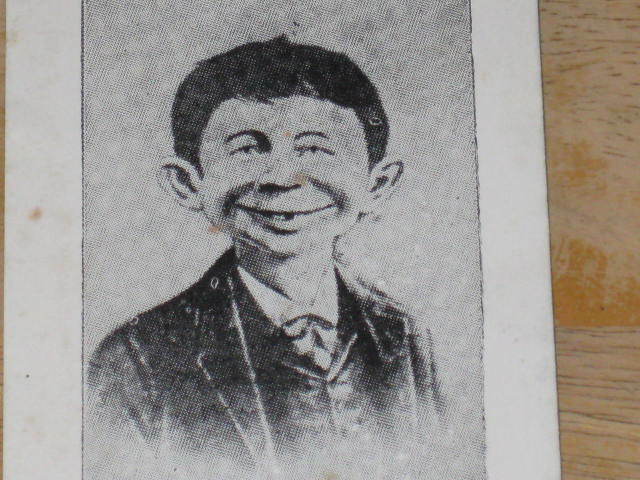 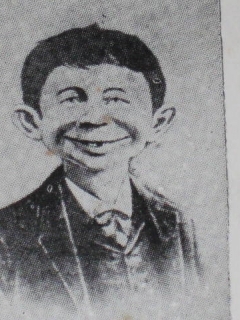 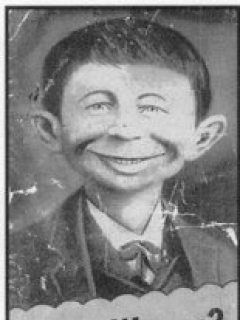 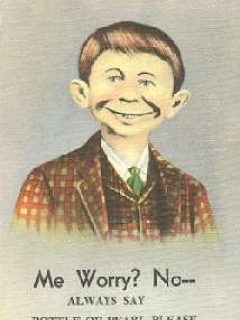 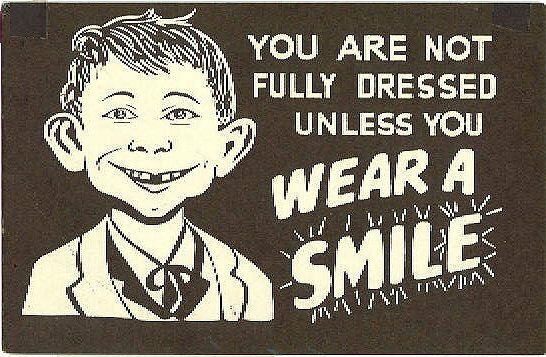 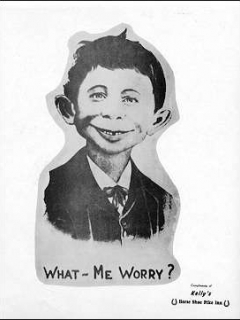 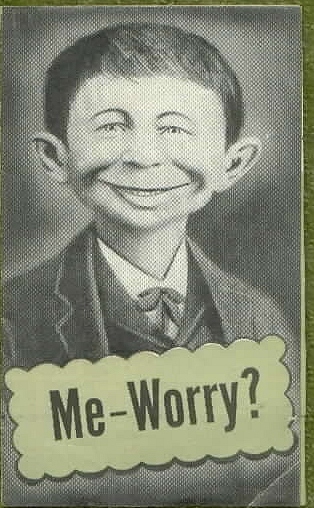 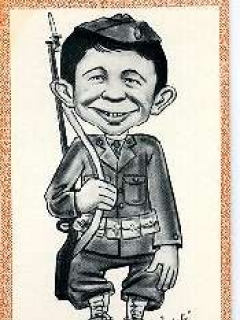 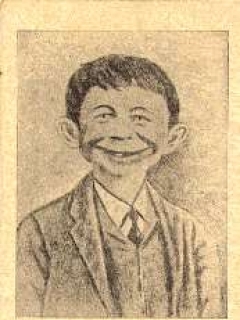 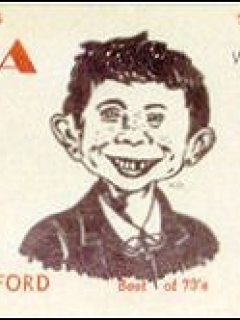 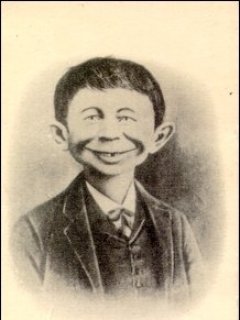 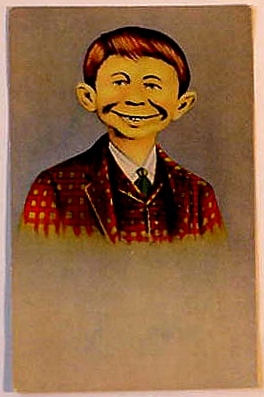 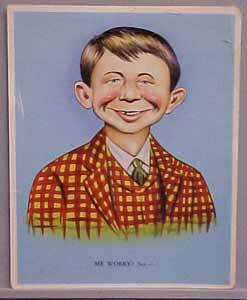 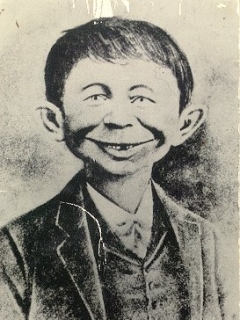 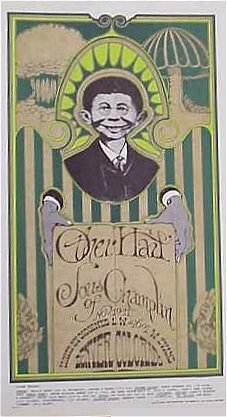 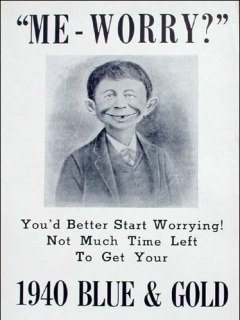 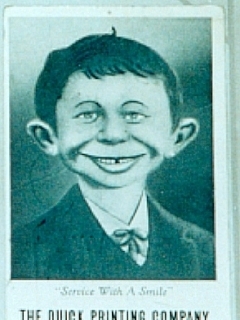 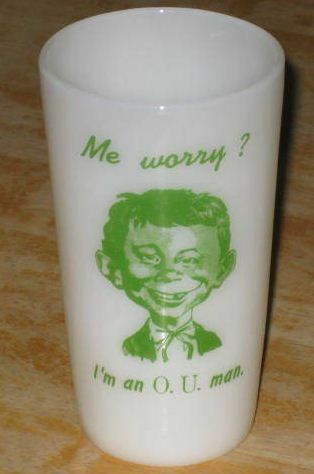 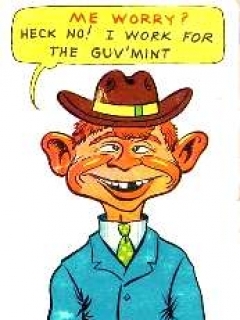 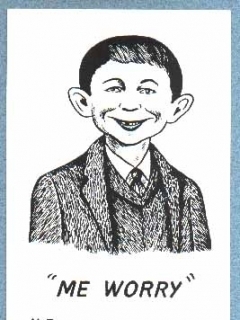 Postcard Pre-MAD Alfred E. Neuman b/w "Me worry? 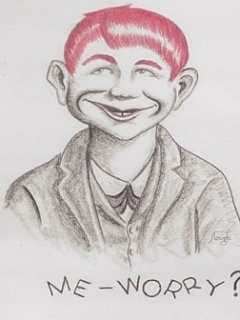 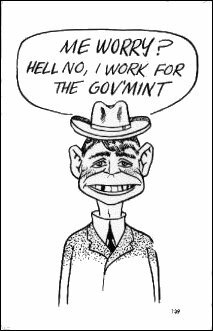 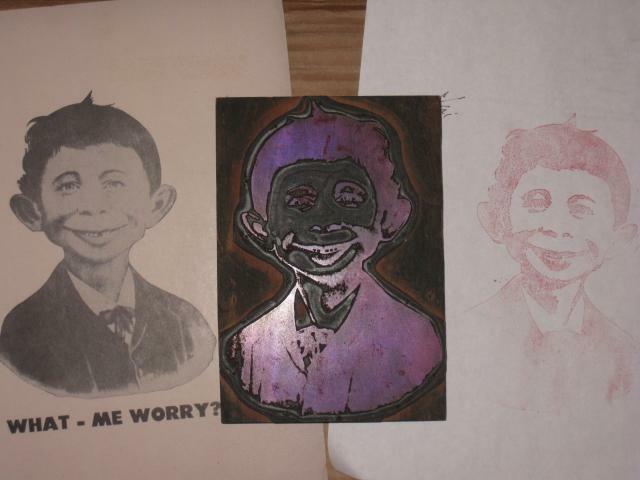 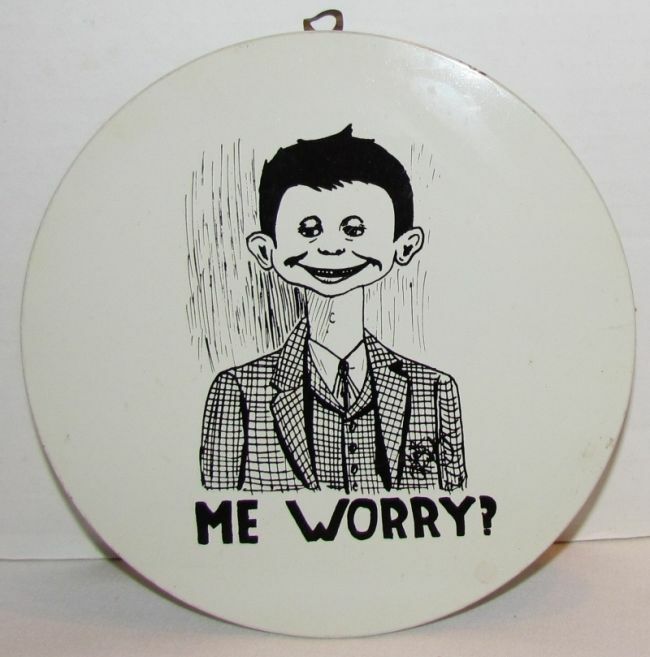 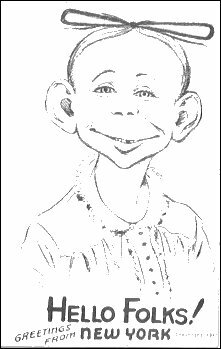 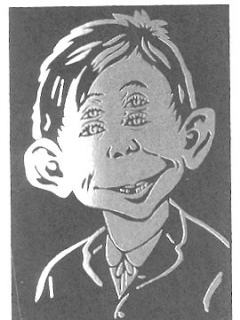 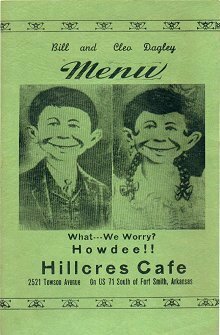 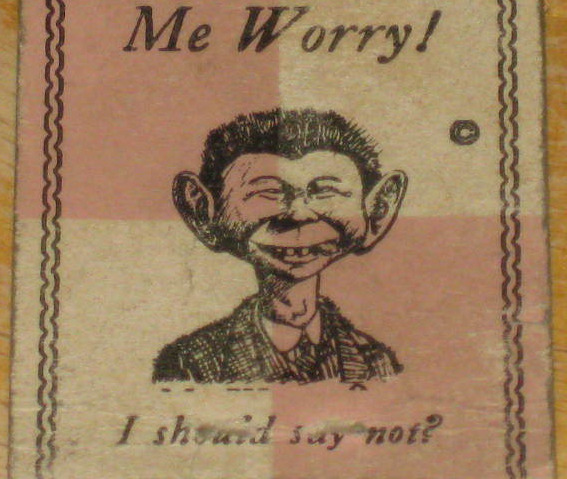 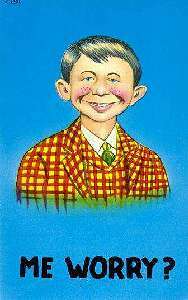 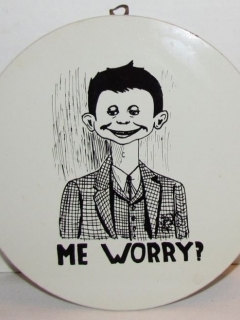 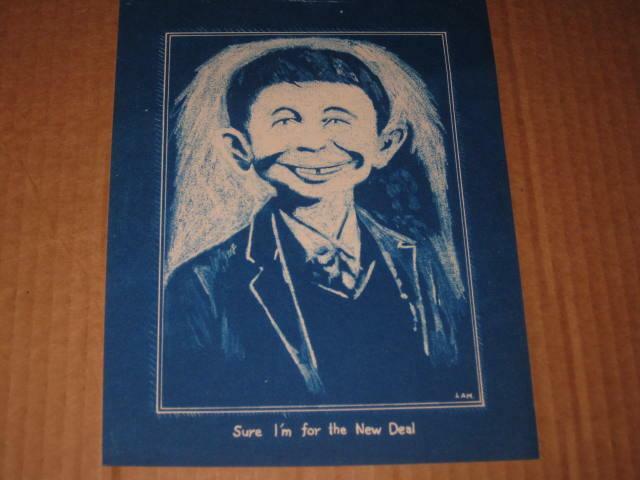 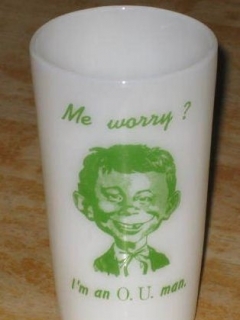 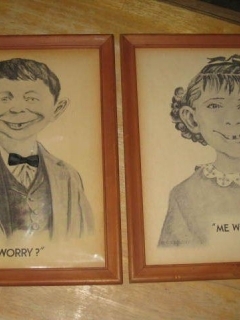 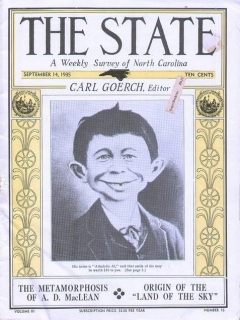 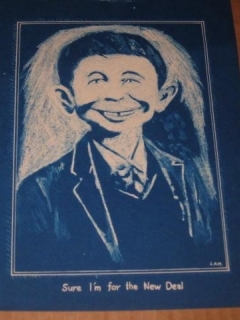 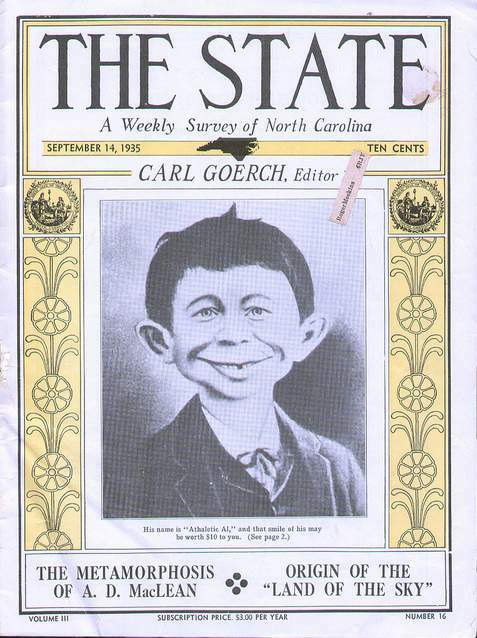 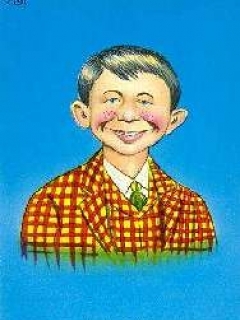 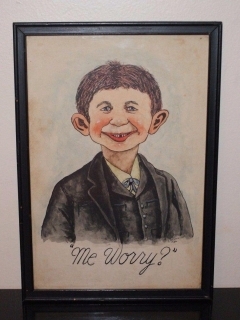 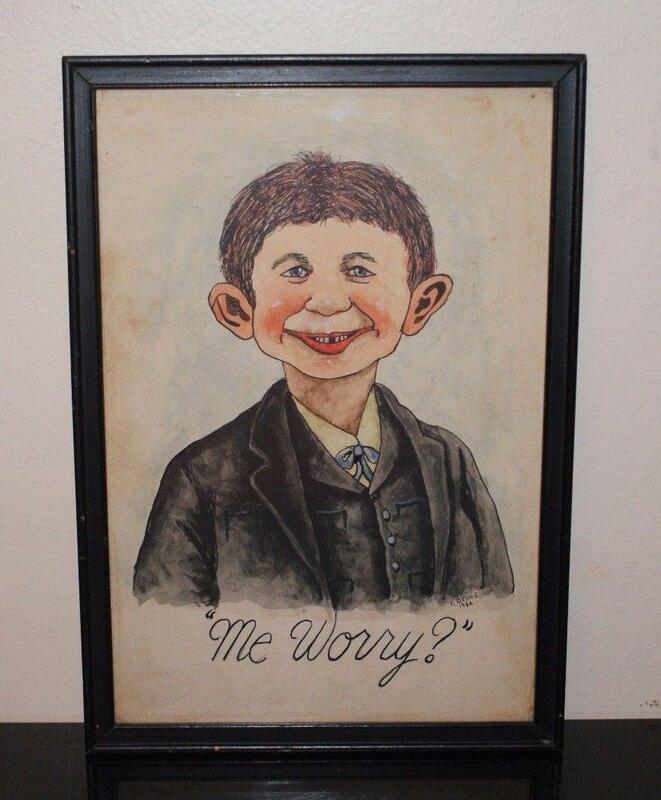 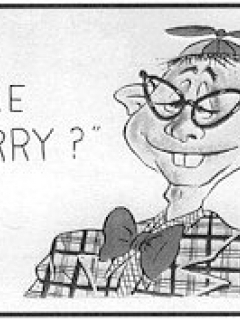 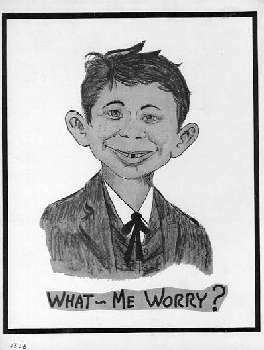 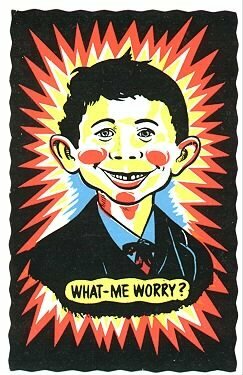 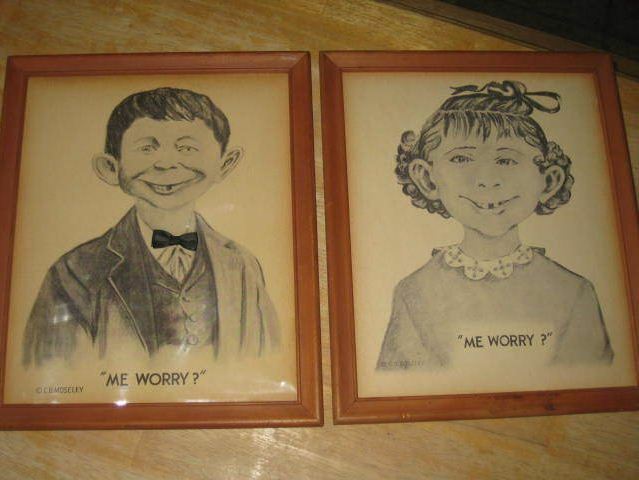 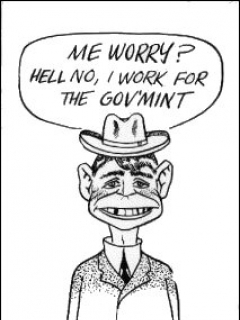 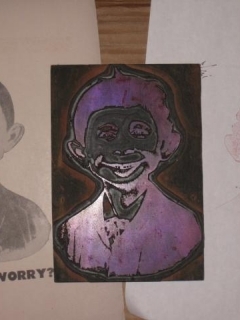 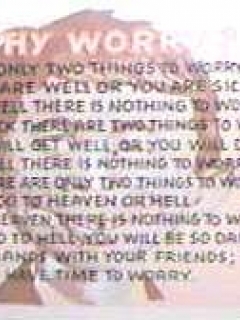 No"
Postcard Pre-MAD Alfred E. Neuman b/w "What me worry?" 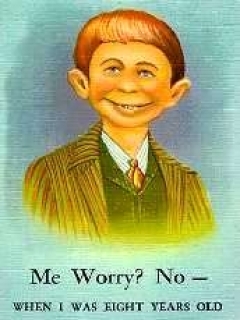 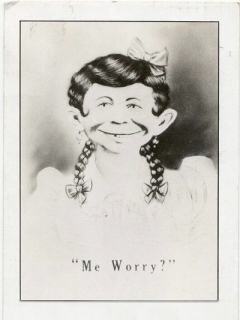 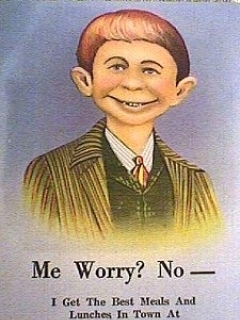 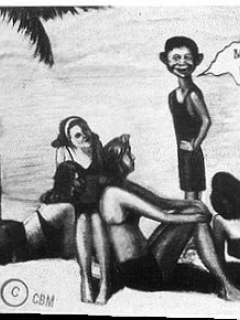 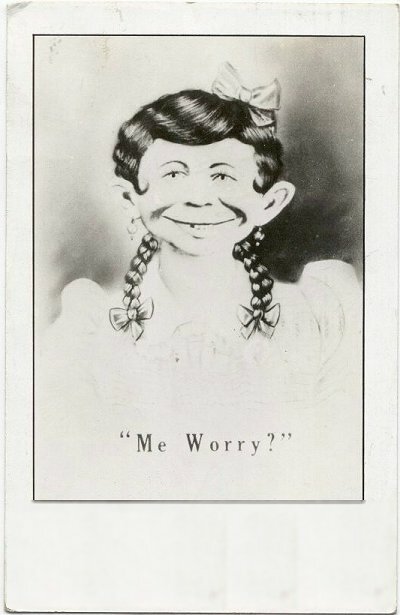 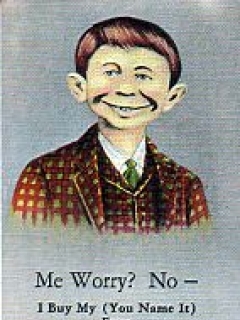 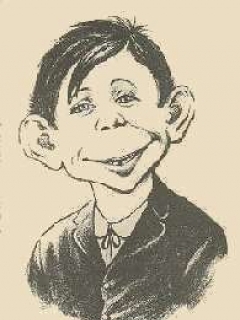 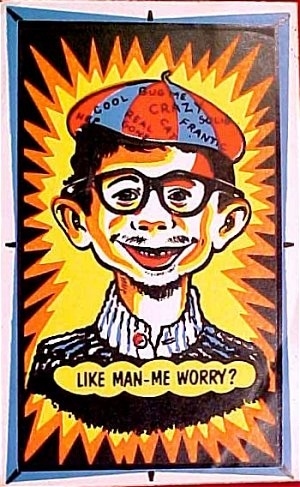 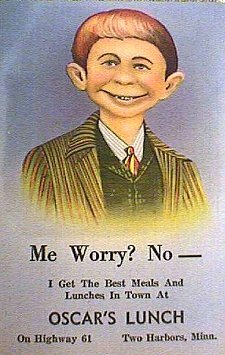 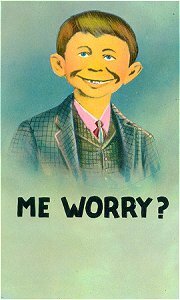 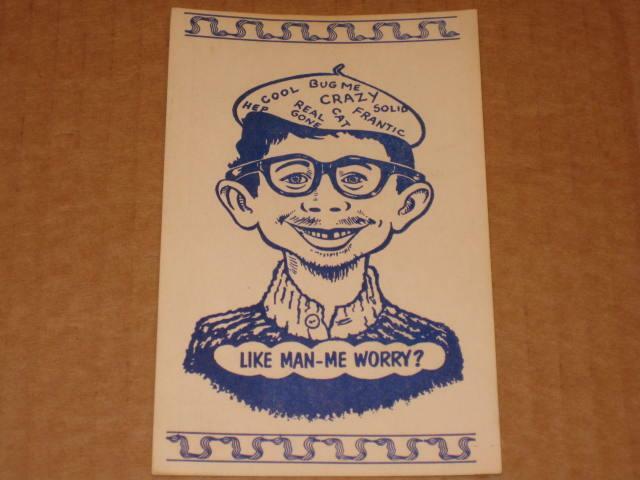 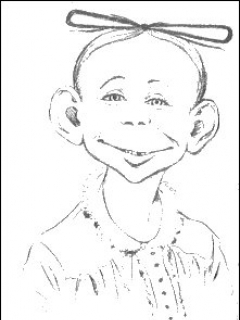 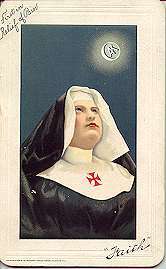 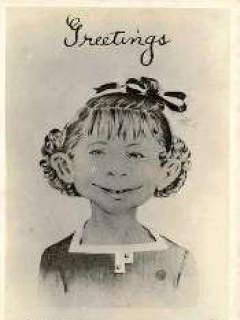 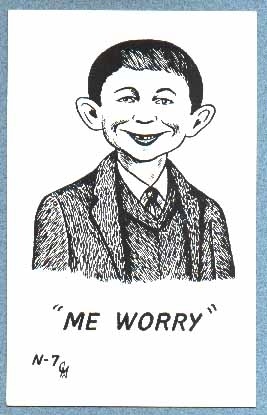 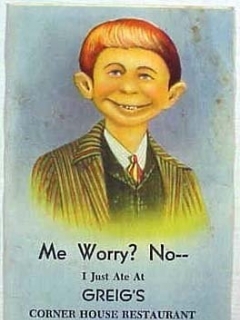 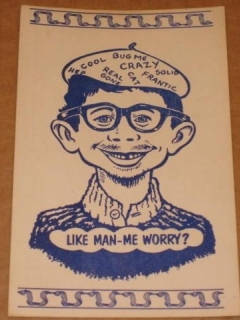 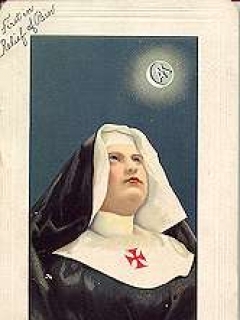 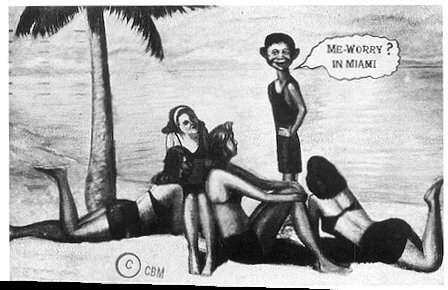 Postcard Pre-MAD Female Alfred E. Neuman "Me worry?" 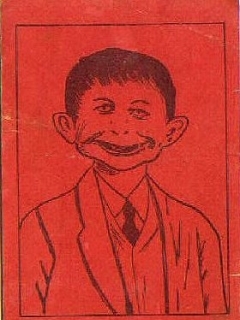 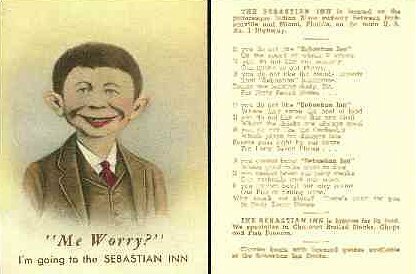 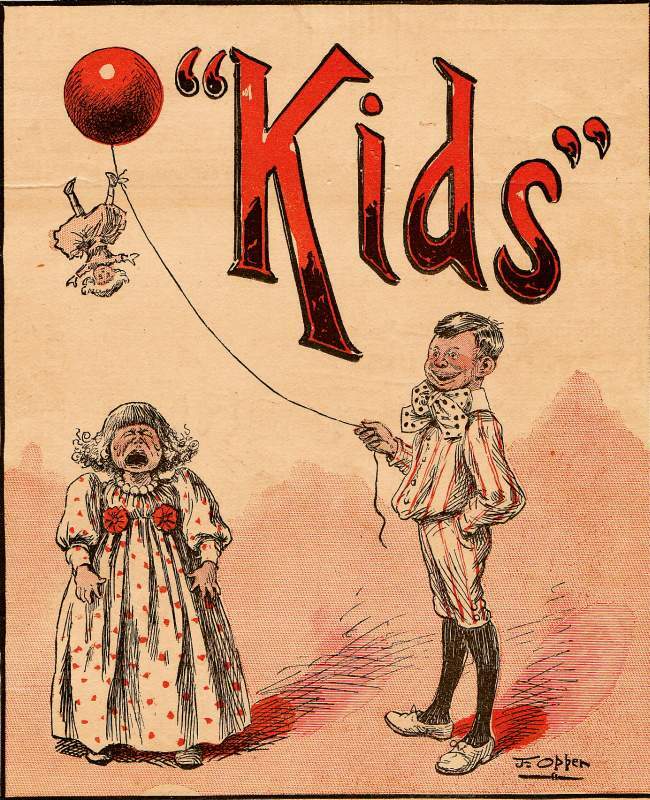 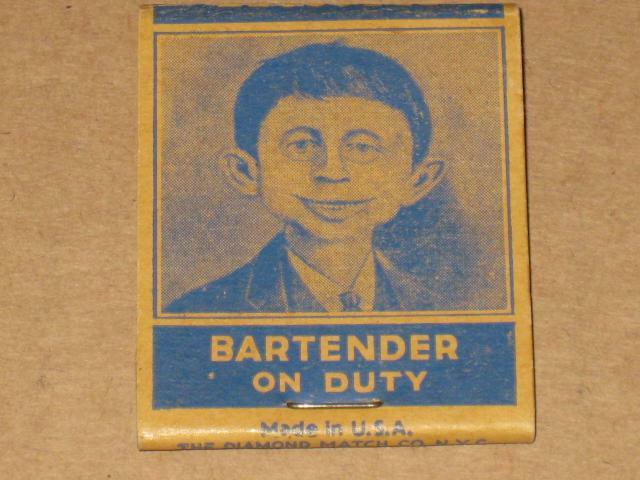 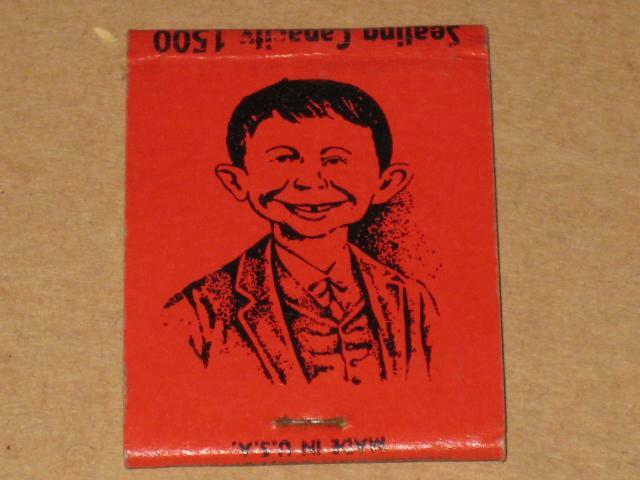 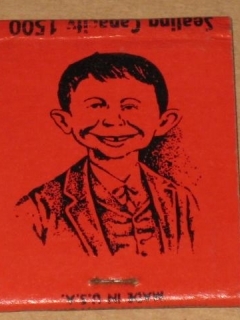 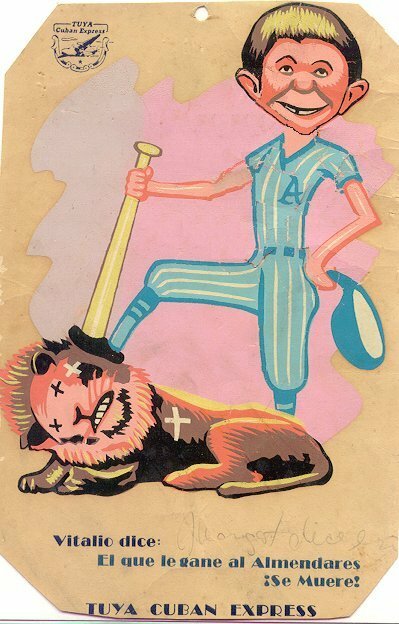 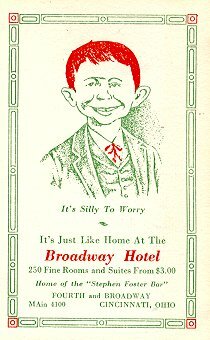 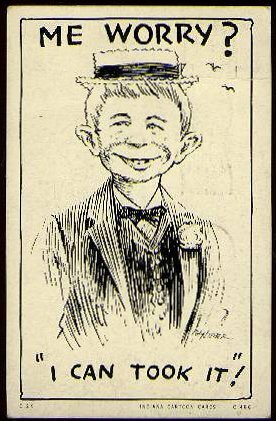 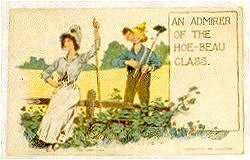 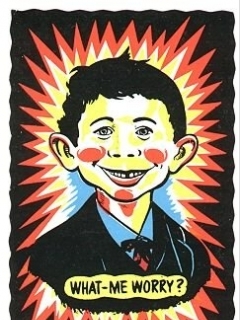 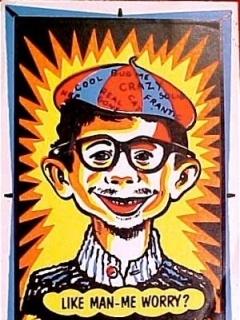 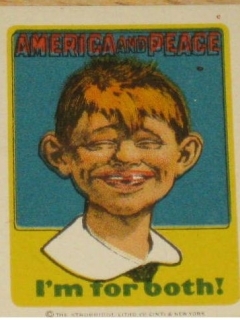 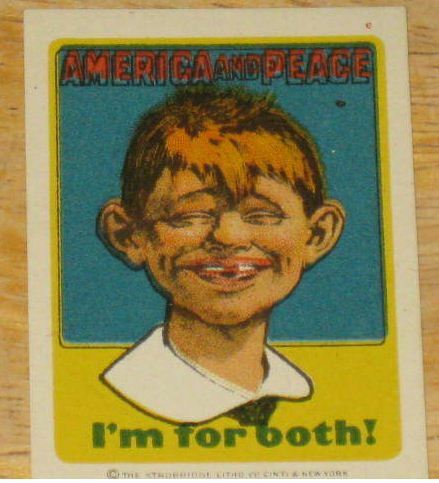 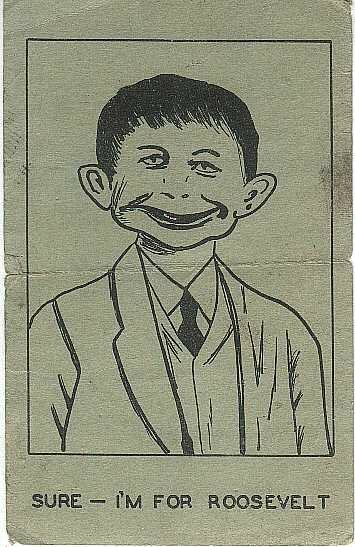 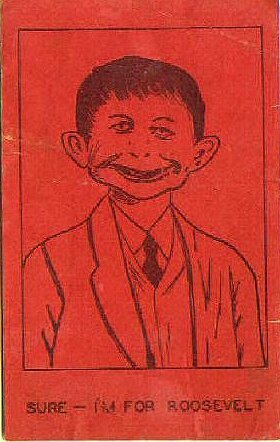 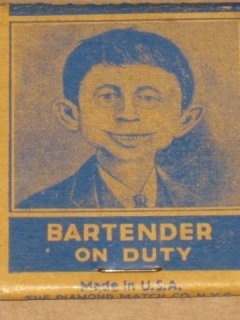 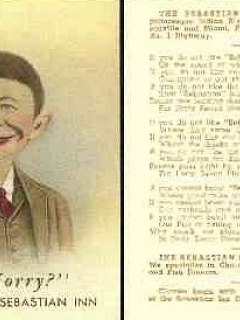 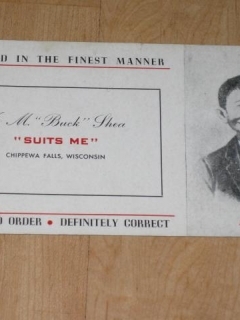 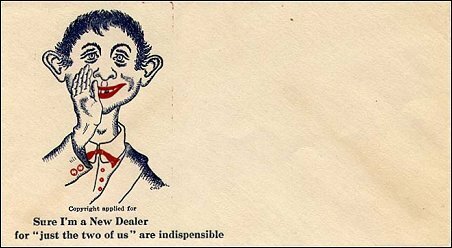 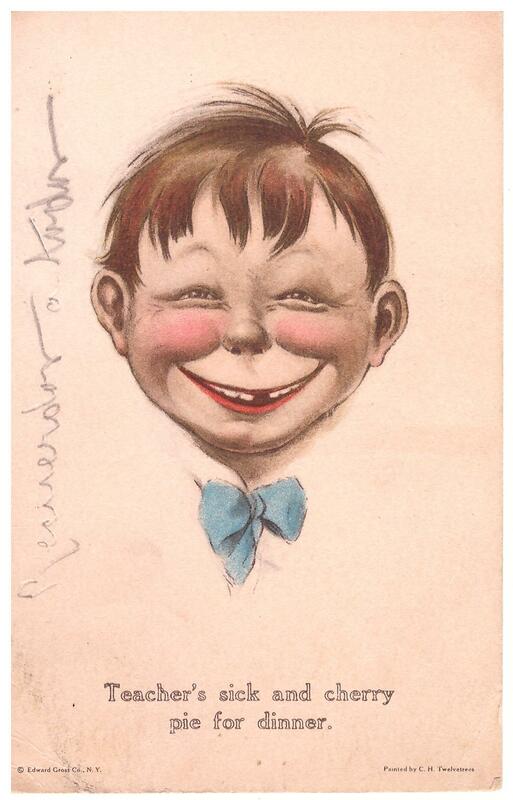 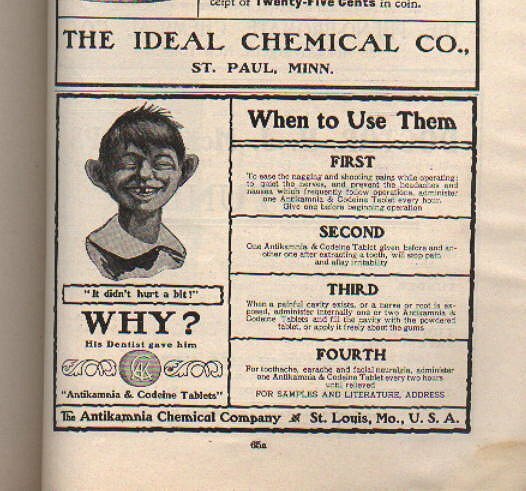 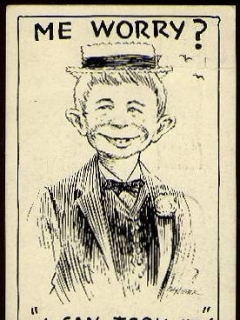 Trade Card Pre-MAD Alfred E. Neuman Small Sebastian Inn Me Worry?